I take the opportunity to present my offerings to the Forumite goody-bag, a collective sack of movie randomness that we’ve agreed to spread back throughout the weekend. My star prize is a District 9 Blu-ray, which I had somehow ended up with two of, and other than that I have a few double dip DVDs that are now surplus to requirements. The sack itself has a Mythbusters coating and was huge, already bulging with the offerings of my fellow Forumites. It also represented a metaphor for what was to come – a giant mixed bag of movie randomness, assembled with loving care by folk who care deeply about movies and who wanted to share that love around. More exciting, though, is seeing actual famous people in the flesh. Kenneth Branagh in the morning ensured that, no matter how little movie knowledge the person I was relaying the story of my trip to had about movies, they would know the name of someone who was there. I must confess now to considering Dead Again the worst movie I’ve ever seen, if taken as a relationship between the level of talent invested and the final product, but I still have faith in Branagh and the footage looks not terrible. I heard some grumbles that the costume Chris Evans is wearing in the Captain America teaser we saw looked scruffy – I’m presuming this is due to the World War II setting and the need to look lived in. But overall, the Marvel panel looked moderately impressive, the highlight being the Captain America footage hot off the set with Hugo Weaving in the bad guy role. The most intriguing moment of the morning was the Cowboys vs Aliens footage. It’s the first time I’ve seen any extended footage in such a rough state so far in advance of a movie’s release, and it’s a little hard to judge the tone of the movie this far out, especially as there was an absence of a lot of the gloss other than some effects added to the third of three clips. Daniel Craig and Harrison Ford sounds like a good combo on paper, but I guess time will tell. We also got some extended footage from up and coming movie-makers during the day, and undoubtedly the most compelling was the first eight minutes of Buried, the movie from director Rodrigo Cortez that consists of Ryan Reynolds in a coffin for an hour and a half. It’s already clear that Cortez has worked hard to make this a cinematic experience and it’s one I’m really looking forward to, as eight minutes felt like nowhere near enough. It’s not all extended clips of movies and heavily promoted trailers, of course; there are other bits of frivolity during the day. On arrival on the Saturday morning, there were the apparently customary goody-bags, which contained such delights as the whole final season of The A Team (yes, the rubbish one where they abandoned the “soldiers of fortune” concept and worked for Robert Vaughn), as well as a couple of other very random DVDs, some jelly beans, a medium Ghostbusters Empire cover T-shirt which I may have a child small enough to fit into one day, lanyards, bumper stickers and other random goodness. The highlight of the lunchtime period was the T-shirt competition. This was mainly a highlight because my fellow Forumite in charge of the goody-bag took the opportunity to bombard the queue for the competition with questions in return for prizes, which wound across the stage and halfway up the stairs. There was a selection of completely random T-shirts, and I entered not in the hope of winning, as the original T-shirt I had planned for this day had proven beyond my limited artistic skills, but simply to feel part of the occasion. 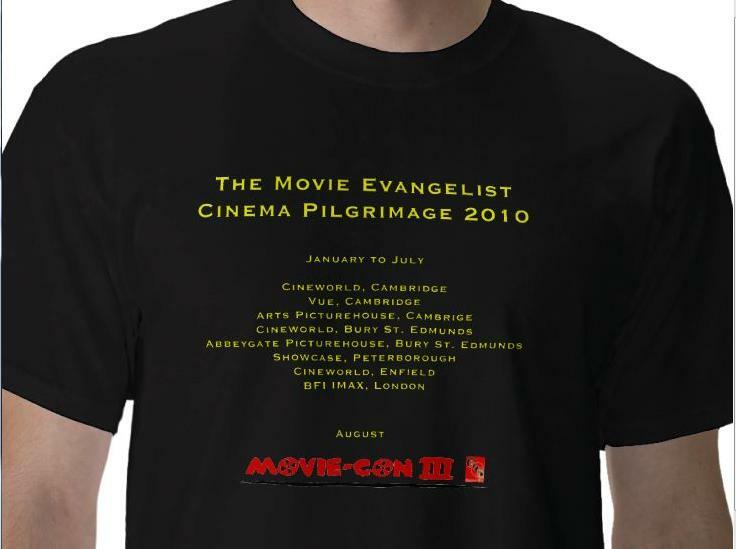 As it turns out, it’s a good job I had no aspirations of winning, as the T-shirt I had settled on, a design of my own making, not only didn’t make the cut in the competition, but encouraged three people not at the con to believe I worked for the BFI. 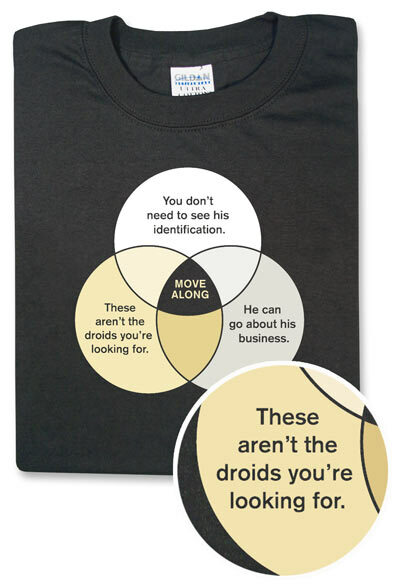 Here, for the record, are the three tees I modelled over the weekend. 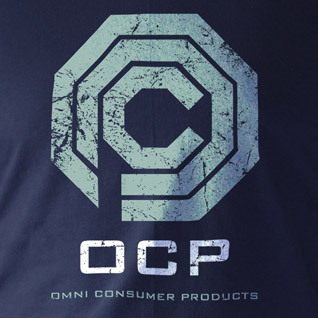 Friday night was a classic OCP shirt from Last Exit To Nowhere, so classic I saw someone else wearing it on the Saturday. For me, there was a particular geeky resonance as the first team I worked for was called Operational Capacity Planning. Sadly, we didn’t have giant robots with mesh foreheads that fell down stairs and shot people lots. My Saturday shirt would, had I had any ability with PC design packages, have been a tribute to the following night’s secret screening (that everyone already knew was Scott Pilgrim thanks to being told before tickets went on sale). The plan was to have a selection of images from Shaun of the Dead, Hot Fuzz and Scott Pilgrim on the front, including at least one image of Simon Pegg and one of Nick Frost (possibly Nicholas Angel and Ed respectively), as well as something Pilgrim-related and also all surrounding a Cornetto, with the legend “The Wright Stuff” at the bottom. On the back would have been a simple legend, something along the lines of “Bring The Noise!” But it was not to be – perhaps if I spend a year learning these packages and not watching movies, I may have enough talent to compose a shirt for next year. Or maybe not. However, while not winning any awards, or even being understood by 99% of people who witnessed it, it did in my mind help to perpetuate a fantasy that my existence is something more than me sitting alone in darkened rooms (and let’s be clear, of the 61 movies, my wife came with me to 9, but the other 52 I went to on my own. Three of those 52 I actually went to completely on my own, as no other bugger could be bothered to turn out. They were City Island, Wild Target and The Rebound, for the record. Finally on Sunday I went for a combination of the mathematical and the Star Wars. A simple combination of the quotes from the first Jedi mind trick from Star Wars (we don’t call it Episode IV round here – house rules, it’s Star Wars and it always bloody will be Star Wars). Simple, effective, even the people in my church choir got it and if I’d thought about it, it should have been the competition T-shirt. It wouldn’t have won, as the two T-shirts that did (one a perfect imitation of a Ghostbusters outfit, one an inflammatory but very funny statemenet about a famous bigoted movie star who shall remain nameless) but it might have had a chance of making the cut. Ah well, if I’d known there were iPads in the offing I’d have probably spent more time on my Wright Stuff idea. Hindsight is a wonderful thing. T-shirt competition over, and a chicken katsu curry consumed from Waterloo station (ideal con food, as it is the equivalent of eating a whole chicken with rice and curry sauce, and negates the need for further food for at least a day), we returned to the afternoon’s extended trailer watching. Twitter spoiled the next bit for me, but at least allowed me to look informed to my companion, as Chloe Moretz tweeted that she would be in attendance. Wowing the crowd with a maturity beyond her thirteen years, she also presented two clips from a movie that she was too young to watch the original of, or indeed read the book, the remake of Let The Right One In, Let Me In. It was a favourite of mine and one of the first Blu-rays I owned, but somehow Matt Reeves seems to have got something going on with this one. My levels of anticipation have risen two or three knotches on seeing the footage. The other personal highlight for me of the afternoon was the presentation of a whole scene of Saw 3D footage, by the actor who appeared in the first one and has been lured back by the promise that absolutely no-one believes that this will be the last one. 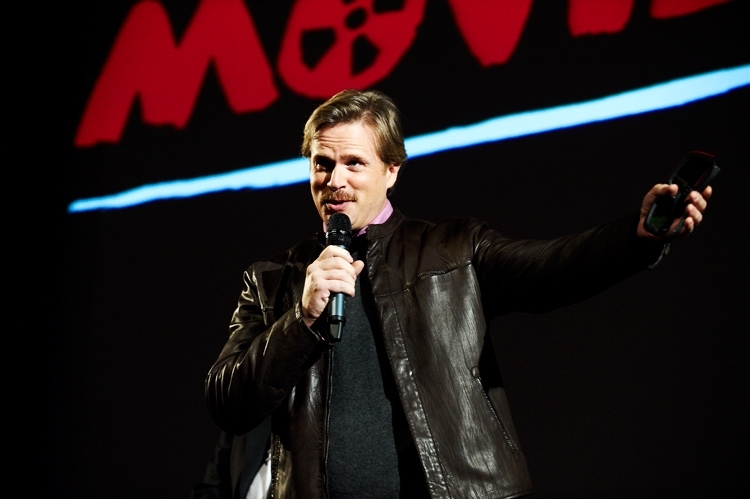 Cary Elwes should be a legend in his own lifetime, but sadly isn’t quite yet. Nonetheless, I plucked up the courage to stick up my hand for a question, and had something planned around The Princess Bride, at least until discovering that the person two questions before me had simply put their hand up to say “I love The Princess Bride”. Fair comment, but I lost all confidence in my question, and mumbled out some random two part question about which movies he gets quoted at him. Unsurprisingly, it’s pretty much only The Princess Bride. I must make a note of redressing that balance by shouting “Prepare for the fight scene!” or something similar if ever happening upon him again. Still he was charming and had a good Spielberg anecdote, which is all you can really ask of anyone. Into the final stretch now, and we had some footage from two Zach Snyder movies, the second of which appears to consist of owls talking in slightly unconvincing Australian accents, although general agreement was that the 3D footage was very impressive. (But it’s talking owls!) There was some extended footage from Tony Scott’s new one, Unstoppable, although sadly no Denzel, Chris Pine or Rosario Dawson to present it. And the main part of the con ended with the arrival of a young man advertised as unavailable earlier; Daniel Radcliffe turned up with some Harry Potter footage and got a rapturous reception, although he’d missed the first standing ovation when someone from the audience proposed on stage to his girlfriend about an hour earlier. I’ve largely kept up with the Potters, although missed the last one, and the initial footage has a different feel about it, taking it out into new locations. So I will try to find the Half-Blood Prince between now and November. That was it; after a general dispersal, many returned for the showing of The Hole in 3D in the evening, which if you track down my review in the Movie-Con section of this blog you’ll find I thought was a disappointment. (Such a disappointment that I’m not even going to link to it. So there.) But the day ended with me tracking down more Forumites holed up in a pub further along the south bank, thanks to the wonders of Google Maps and phone GPS and Twitter reassuring me that they were still there and still drinking. It’s been a long time since I got to sit and talk about movies with a group of like minded and largely more knowledgeable folk than myself, and fortunately a nicer bunch of people you couldn’t wish for. Heading back to the tube with a slightly heavy heart, I knew that I’d not be in much before midnight; as it turned out, having to relay the day’s events to my humouring wife and trying to come down from the excitement high of the day’s events took me until around two in the morning. It was going to be another short night ahead.